Cracking in a refinery is a process where the long organic chains in oil are broken to produce shorter chain organics that are more valuable than the oil. Fluid catalytic cracking (FCC) has generally replaced thermal cracking of petroleum hydrocarbon feed stocks. FCC produces more gasoline with a higher octane rating. FCC’s byproduct gases are more olefinic and valuable than those produced by thermal cracking. The FCC process can also convert heavy oils such as oil sands into lighter, more valuable fuel products such as gasoline. This increases refinery profit and allows a wider range of process feed stocks. The byproduct gas emissions are classified as hazardous waste. Increasingly stringent environmental regulations require the scrubbing of exhaust gases prior to environmental discharge. Scrubbing removes particulates including sulfur dioxide (SO2) and nitrogen oxides (NOx) by washing them from the flue gas stream. NOx is a generic term for the mono-nitrogen oxides NO and NO2 (nitric oxide and nitrogen dioxide). If released to the atmosphere, NOx reacts to form smog and acid rain. Scrubbing is accomplished by spraying an aqueous scrubbing liquid within the flue gas in a vessel that is part of the stack system. This process is much the same as flue gas scrubbers in other applications such as flue gas desulfurization (FGD). After scrubbing, the clean flue gas is vented to the atmosphere and the SO2 and NOx-laden liquid flows to the thickener for treatment. The thickener’s flocculating turbine turns at low speed imparting the mixing energy required for inlet stream particles to contact one another in order to form flocs. The mixing energy is carefully engineered so as to avoid shearing the newly formed flocs. A sludge layer is formed in the thickener as solids settle. This is expected and engineered into the thickener design. Nevertheless, it can grow quite heavy in the event of an upstream process upset. This can result in an increased torque load on the rake mechanism. Inadequate sludge removal can also cause torque to increase. In either case, the unit is equipped with a torque sensor which will activate the rake lift motor at preset torque levels. This mechanism will raise the rake assembly twice in one-foot increments, each time actuating an alarm in the control room. If the torque continues to rise after the second lift and alarm sequence, the unit sounds a third alarm and shuts off the rake drive until the problem is corrected. The thickener tank’s top and sides are insulated. This is to prevent the liquid near the perimeter and top of the tank from cooling at unequal rates compared with the liquid at the center of the tank. If the liquids are allowed to cool at different rates, thermal currents cause unwanted mixing. If not insulated, these currents would adversely affect the thickener’s efficiency. If enhanced clarity is desired, a gravity filter may be used to polish the thickener effluent. Oil refineries create large amounts of oily wastewater. The wastewater usually contains flammable material, so all equipment is covered and sealed. The air above the wastewater is displaced by nitrogen (nitrogen blanketed) so that fires or explosions cannot take place. The wastewater also may contain heavy metals such as cobalt, iron, copper, etc. The first step in refinery wastewater treatment is an American Petroleum Institute (API) design oil/water separator. API requires a long and shallow rectangular concrete basin with width set by flow rate. WesTech has developed and sold circular oil/water separators built to API standards. The oil/water separator creates a laminar flow that allows oil to rise to the top and solids to drop to the bottom. The solids are collected through various means and sent to a bottoms tank. The contents of the bottoms tank are then pumped to a filter press where free water and oil are removed. Polymer is usually added to the material flowing to the press to improve filtration. The free oil is skimmed from the oil/water separator and flows over a weir to an oil recovery tank. The recovered oil is then pumped back to the process. The wastewater flows from the oil/water separator to an equalization tank. Polymer is added to the wastewater as it is pumped to a dissolved gas flotation (DGF) unit. Some of the effluent from the DGF flows through a pressurization skid where a gas is dissolved in the water under pressure. The water with dissolved gas is recycled back to the DGF. The DGF is not pressurized, so the recycle flow releases most of the dissolved gas which creates bubbles. The bubbles flow up through the wastewater and collect any oil that is present. The gas and oil floats to the top of the water where the bubbles burst and the oil is released to float. This “float” is skimmed and flows to the oil recovery tank. The wastewater then flows to a biotreater where bacteria consume the bulk of the remaining hydrocarbons. Sludge is created as the bacteria grow and must be removed from the system. Part of the sludge is recycled back to the front of the system (recycled activated sludge) and the rest is sent to sludge digestion (waste activated sludge). Effluent from the sludge digester is pumped to a dissolved air flotation (DAF) unit. Some of the effluent from the DAF flows through a pressurization skid where a gas is dissolved in the water under pressure. This water with dissolved air is recycled back to the DAF. Bubbles are formed that then float the sludge to the top of the DAF. The sludge is skimmed and pumped to a belt filter for drying and disposal. Treated wastewater flows to a sump where it is recycled back to the plant processes. The American Petroleum Industry (API) developed design guidelines for oil/water separators in the early twentieth century. 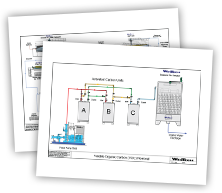 These rectangular design guidelines have remained remarkably constant since that time, and oil/water separators have become standard equipment worldwide. The design goal of these separators is to create a quiescent zone in which oil droplets can float and coalesce on the surface for skimming and removal. Settled solids are transported to a collection sump for disposal. Factors governing the separation of fats, oil and grease (FOG) from wastewater include: viscosity of the fluids, temperature of the waste stream, particle size, specific gravity of the FOG, the apparent specific gravity of solids coated with oil, retention time, and turbulence created in the oil / water separator. These factors are not affected by separator geometry. Traditional separators have been rectangular. While small units have the advantage of shop assembly, all rectangular units require submerged bearing, chain and flight skimmers. With many submerged moving parts, these older units are notoriously maintenance intensive. The units are difficult to seal to prevent the escape of volatile organic carbons (VOC). This was not an issue when the units were first put into service, but had become a matter of regulation by the EPA, causing rectangular units to require retrofit, replacement, or abandonment. Sealing difficulties lie in the many sections of the covers required for long tanks, numerous access openings in the covers required for maintenance and inspection, difficulty in sealing chain drive shaft penetrations, and retrofit difficulties with old concrete or steel tanks. Weaknesses with rectangular separators include chain deterioration and oily sludge removal. As sludge builds up to the rakes, the submerged bearings and chain-driven rakes fail because they cannot push the viscous sludge. If the rakes fail, the separator must be shut down and emptied for repair. Repair is hindered by vapor control covers that must be removed. Operators avoid frequent equipment failures by pumping out overly dilute sludge to maintain a low sludge layer. The rakes in circular units are designed to transport dense sludge loads. Circular clarifiers are commonly used for heavy oily sludge thickening in refineries. Circular units can concentrate sludges up to 5%, so no additional thickening is required before treatment. Circular unit maintenance is simplified with fewer moving parts, and the motor and gearbox are located above the domed VOC containment roof. Circular units may also be installed in existing, yet vacant, tanks at significant cost savings. Maximum flow through rectangular units is limited by the length-to-width ratio and available real estate. Circular units easily function at diameters over 100 feet and offer much higher flow capacity. As with other instances of technology reapplication, performance track records are short. Nevertheless, the potential increases in efficiency coupled with the decreases in maintenance costs means consideration of circular separators should be given for new installations as well as existing plants. Surface water pretreatment prepares water for use in any type of treatment plant (i.e., power, chemical, petrochemical, etc.) and is needed when the source of water comes from a raw/contaminated source (usually river water) where the total suspended solids (TSS) can range from 50 mg/L – 200 mg/L. This treatment consists of four steps: chemical pretreatment, clarification, filtration, and sludge treatment. Sodium hypochlorite (bleach) is added to kill any living organisms that may be in the raw water. Coagulant helps particles come together to improve clarity and settling. Polymer turns individual particles into larger clusters. The larger particles settle faster and form a more concentrated sludge. RapiSand™ Ballasted Flocculation is a high-rate water clarifying system utilizing both chemical and physical treatments to remove suspended solids and unwanted particles. The process uses the proven flocculation technique of adding a dense ballast sand, allowing for much higher settling rates. Raw water is mixed with a coagulation agent to destabilize and neutralize particles in the water. During the next step of flocculation, sand and polymer are combined with the coagulated flow. The flocculation mixer provides the particles with enough energy to stay suspended and grow in size. In the sedimentation area, developed floc particles (coagulant, polymer, sand, and solids) are allowed to settle to the bottom. Clarified water may pass through tube settlers or inclined plate settlers before it is drawn off the top of the sedimentation basin. The settled solids are gathered and pumped from the sedimentation area through a hydrocyclone where the sand is separated for reuse and the solids are processed further. If necessary, the overflow can be treated by filtration. The process starts in an equalization tank that allows for a constant flow into the dual media filters. As the water flows from the RapiSand™ to the dual media filter, polymer may be added to improve filtration. The resulting water is now less than 1mg/L TSS. It may be directly sent to a cooling tower or it can be further filtered depending on the intended use. If the water is being used for a boiler then it may need to go through reverse osmosis. An ultrafiltration membrane system removes small suspended solids from the water to improve the efficiency of the reverse osmosis system. The underflow of the RapiSand™ is pumped into a thickener. Polymer is added to improve settling and clarity. The thickened underflow is sent to a filter press or other type of vacuum or pressure dewatering filter. The slurry is pumped into the filter press under pressure to force the moisture out. The filter press may require additional polymer to function properly. The cake is then hauled off for disposal and the pressate and wash water is recirculated for further use. The pressate and cloth wash water get pumped to the reclaim water storage sump with the backwash from the filtration systems. Volatile organic carbon (VOC) are regulated organic compounds that are either hazardous to breathe or flammable. Usually these chemicals are removed by means of activated carbon usually followed by air stripping. This method has been shown to remove 95%+ of these compounds. For small flows, the system consists of three (3) activated carbon units followed by a forced draft aerator. The activated carbon units are run in series in order to obtain maximum effectiveness. Unit A begins as the lead unit with Unit B as the lag unit. To simplify the piping and reduce the number of valves, Unit C is always the polishing unit. The units are 5’ diameter by 72” bed depth and contain 3,000 lbs. of activated carbon. These units are designed to be regenerated offsite and should have a capacity of at least 30 days. When Unit A exhausts, it is replaced by a freshly regenerated unit. At this time, Unit B becomes the lead unit and Unit A becomes the lag unit. In this way, the lag unit always has the greatest capacity. The units are piped and valved such that they can be isolated, removed, and the order of operation changed while the system is online. Unit C is always the polishing unit and should be changed every six months whether it needs it or not. This will prevent problems with bed compaction, biological growth, etc. As stated above, the units are regenerated offsite. Spare units may be stored onsite for use when inline units become exhausted. After the removal of the majority of VOC’s via the activated carbon, the stream is fed to a forced draft aerator for stripping of the last remnant of the VOC’s. This minimizes the amount of VOC’s discharged to the atmosphere. Following this step, the stream is discharged to the receiving waters. If the concentration of VOC’s is too high in the deaerator effluent air, activated carbon can be used again or the VOC’s may be destroyed by several means, such as burning. One of the advantages of this system is that it would be a fairly straightforward task to pilot the treatment effectiveness. For plants with a flare, all vapors are usually gathered and sent to the flare. Natural gas is added to the vent stream and then all organics are burned in the flare. This system removes >99.9% of all organics.